Although now in a ruined state, with its huge capstone having fallen off, Zennor Quoit is still an impressive monument. Quoits (also called Dolmens or Cromlechs) are probably the earliest of any of the prehistoric monuments remaining, dating from the early Neolithic period (3500-2500 BC), and were constructed by the early farmers who had recently settled and begun to plant crops and raise cattle. Each group of farmers occupied their own area or territory, and on high ground nearby would construct one of these Quoits. They may originally, or subsequently, have been covered by an earth mound, but the capstone itself may have remained uncovered. 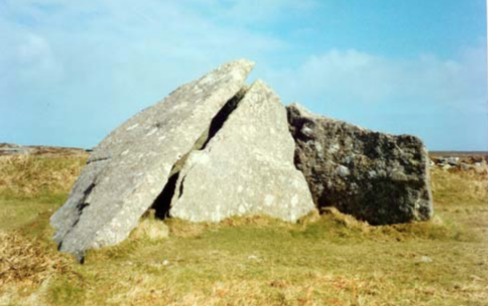 Zennor is slightly different from Chûn and Mulfra Quoits [also available as downloadable leaflets] in that it originally had two large facade stones, forming an antechamber to the monument, which may have been used for rituals. The chamber behind is 2.4m (8ft) high, and the whole structure once stood within a barrow 12.8m (42ft) in diameter. The capstone is 5.5m (18ft) long, 2.9m (9.5ft) wide and weighs 9.3 tons. Stones standing to the E of the monument are the remains of a more modern (19th century) cow shed. Zennor lies about 2 miles west of St.Ives on the B3306 St.Ives to St.Just road. The Quoit lies on the West Penwith moors above. From Zennor drive eastwards towards St.Ives for about 0.75 mile as the road climbs towards a house on the summit called Eagle’s Nest. Just past here there is a small layby where a car or two may be parked. Walk back up to Eagle’s Nest, and opposite the house a track leads up on to the Moors. Where the track divides, take the left hand fork towards a ruined (mine) building. Opposite this ruin, a smaller track heads west towards Zennor Quoit which is visible a few hundred yards further on. Legend claims that any stone removed from the Quoit will find its way back overnight. This was put to the test in 1861 when a farmer who attempted to break up the Quoit to build the cow shed mentioned above was prevented from doing so, not by the mysterious powers of the stones, but by the antiquarian vicar W.C.Borlase who bribed him to leave the site alone! Zennor is one of a number of quoits (approximately 8) remaining in West Penwith. These sites were probably designed as repositories for the bones of the dead, whose bodies may have been laid out on the capstones for the carrion birds to remove the flesh (a practice known as excarnation). Yet it would be a mistake to think of these monuments simply as ‘burial chambers’. The bone evidence from other places indicates that the disarticulated bones of a number of individuals may have been placed inside, and from time to time some bones were removed and were replaced by others. We may perhaps rather think of these sites as places where the tribe (or the shamans of the tribe) would go to consult with the spir- its of their dead ancestors in trance journeys and altered states of consciousness.